Grumman Cat Flight -- Sorry we missed the Tigercat here! The Camarillo Airshow promised a furball. 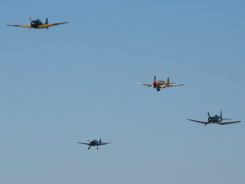 The warbird tease was, "The four hour narrated flying exhibition will conclude with an exciting flyby of WWII fighters, bombers, transports and trainers... thundering past the viewers in a modified furball. This is going to be an aviation experience you don't want to miss." Well, we never want to miss seeing lots of warbirds fly, and that sounded like fun, but exactly what is a furball? No, it has nothing to do with cats.... although there was a "cat flight" involved. ....several aircraft in tight air combat maneuvering or dogfighting. They had a bunch of AT-6s and Nanchang CJ-6 Chinese Trainers. They had a B-25, a Lockheed 12 and a C-53C (D-Day Doll actually flew in the invasion on D-Day). 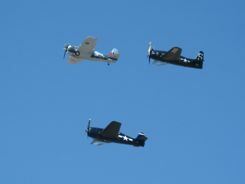 They had a Grumman "Cat Flight".... a Hellcat, a Wildcat, a Tiger Cat and a Bearcat. 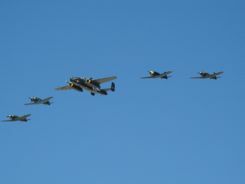 They had a Mitsubishi Zero (a real one), a P-40 Warhawk, a Corsair, and two P-38 Lightnings. The only reason the Mustang didn't join in is because the pilot was flying the Zero! What the air boss did in Camarillo was to launch several groups of these aircraft flying in formation... each group at a different altitude and flying a slight different pattern. They said they had twenty-eight in the air, but who was counting? What it looked like from the ground was... well, it looked like a furball! We're glad we didn't miss it. It's a great air show, and we plan to go back next year and see what they come up with! 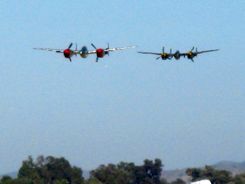 We'll get a full page up about the Wings Over Camarillo Air Show soon.